The brown dog tick (Rhipicephalus sanguineus) can transmit diseases to dogs and humans, including babesiosis. Australian and New Zealand veterinarians need to change the way they think about vector borne diseases, according to canine medicine specialist Associate Professor Peter Irwin. Irwin, based at Murdoch University, said that while Australia and New Zealand are free of many significant vector borne diseases (VBDs), emergence of these in previously unaffected regions raises concerns that this may not always be the case. 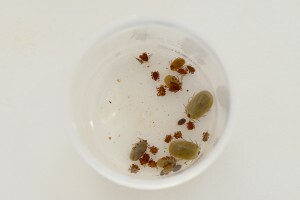 Ticks, fleas and sand flies are vectors of the most significant canine VBDs, including borreliosis (known as Lyme disease), babesiosis, bartonellosis, ehrlichiosis, hepatozoonosis and leishmaniosis. Australia and New Zealand are free of ehrlichiosis, leishmaniosis, hepatozoonosis and Lyme borreliosis, but the risk of these diseases becoming established is very real. Screening for some pathogens in imported companion animals is required by the Australian Quarantine and Inspection Service (AQIS), but there are case reports of leishmaniosis in dogs imported prior to screening. While sand flies are the only proven vector of leishmaniosis, transmission is possible via nonvectorial routes. Irwin advises veterinarians to expect the unexpected, as animals with so-called “exotic disease” can present at any time. The most common clinicopathological abnormalities associated with VBDs include fever of unknown origin, weight loss, shifting lameness, lymphadenomegaly, splenomegaly, anaemia, thrombocytopenia, hyperglobulinaemia and proteinuria – many of which are seen with immune-mediated, neoplastic and other systemic diseases. Another complicating factor is the incidence of co-infection. Because coinfection with VBDs is the rule rather than the exception, the diagnosis of one VBD should immediately raise suspicion about the presence of other vector-borne pathogens. “Veterinarians need to maintain clinical vigilance,” he said. This includes taking a travel history, and alerting authorities when an exotic disease is suspected. He added that fleas are more than a nuisance and need to be considered in relation to public health. “Fleas are much more significant from a public health perspective than previously assumed,” he said. In a previous overseas study, sharing a bed with a pet dog (a common practice in Australia) was significantly associated with infection with Yersinia pestis. Fleas can also transmit bartonellosis, haemotropic mycoplasma and cat flea typhus. For this reason, ectoparasite control is important for human health as much as animal wellbeing. “Prevention is easier and better than cure,” he said. Irwin emphasised the importance of continuing education, as the epidemiology of VBD is changing rapidly and diagnostic technology is improving continually. He said that veterinarians are increasingly expected to provide advice about matters pertaining to VBDs. “Zoonotic diseases associated with companion animal ownership are increasingly receiving the attention of healthcare professionals, policy makers and the general public,” he said. Useful resources are available at www.cvbd.org, www.capcvet.org and www.esccap.org. Irwin PJ and Acke E (2013) Panorama of VBD of Pets in Australia, New Zealand and Pacific Islands. In Beugnet F (editor): Guide to Vector Borne Diseases of Pets. Published by Merial, Lyon, France. ISBN 978-2-915758-40-5. pp 109-122.